Tony Hawk is arguably the greatest skateboarder of all time. His son, Riley Hawk, is also now a professional skateboarder. 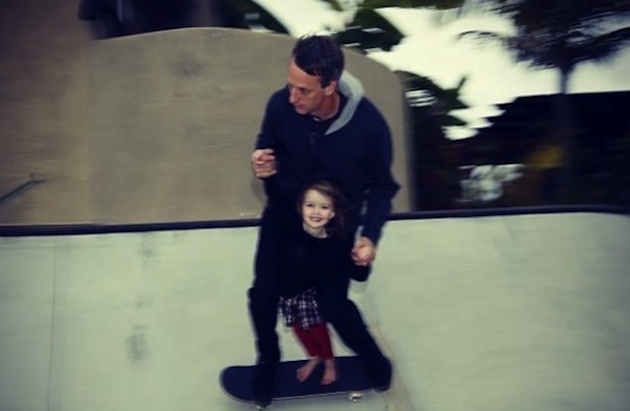 Hawk’s youngest daughter, Kadence, is not a professional skateboarder -- at least not yet -- so her Dad sometimes takes her along for brief joy rides on his board in his backyard concrete skating paradise. For a 4-year-old, that’s a pretty cool ride. After one recent outing, Hawk posted photos of himself swinging Kadence from his board as they neared the lip of his backyard park’s bowl on the social media site Instagram, via Twitter. The 4-year-old looks thrilled with the ride, but drew scorn from a number of followers because neither she nor Hawk were wearing a helmet. Hawk responded the following day with another photo of himself riding with Kadence, along with a brief note defending his parenting. Odd parenting? Sure. Effective? It’s far too soon to know. Still, to this point Kadence has yet to be injured while riding with her father on a skateboard, or while being taped to a wall. If she ends up becoming as successful as her half-brother Riley in the action sports world, she and her father might even have the last laugh.